8 Sept. 1771–15 Sept. 1850. Born in Gilsum, Cheshire Co., New Hampshire. Daughter of Stephen Bond and Mary Yemmons. Married Stephen Mack, 1788, in Gilsum. Moved to Tunbridge, Orange Co., Vermont. Moved to Norwich, Orange Co., 1816; to Detroit, by 1822; and to Pontiac, Oakland Co., Michigan Territory, 1823. Husband died, 1826. Presumably baptized into LDS church. Moved to Kirtland, Geauga Co., Ohio; to Far West, Caldwell Co., Missouri, by 30 Dec. 1838; to Nauvoo, Hancock Co., Illinois, by Sept. 1841; back to Pontiac, 1844; back to Nauvoo, by 1845; to what became Council Bluffs, Pottawattamie Co., Iowa Territory, 1846; and to Winter Quarters, unorganized U.S. territory (later in Omaha, Douglas Co., Nebraska), 1846. Arrived in Salt Lake City, 20 Sept. 1848. Died at Salt Lake City. 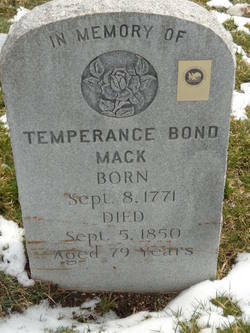 Temperance Bond was born September 08, 1771 in Gilsum, Cheshire, NH, and died September 08, 1850 in Salt Lake City, UT. She married Stephen Andrew Mack on 1788 in Gilsum, NH, son of Solomon Mack and Lydia Gates. Fanny Mack, d. date unknown, Y.
Andrew Mack, d. date unknown, Y.
John Mack, d. date unknown, Y.
Temperance Mack, d. date unknown, Y.
Polly Mack, d. date unknown, Y. +Stephen Mack, b. February 02, 1798, Tunbridge, VT, d. April 10, 1850, Rockton (Macktown), IL. History - Stephen Mack was engaged in the mercantile and tinning business at Tunbridge, Vermont, finally extended his enterprises westward as far as Detroit, Michigan. He was in Detroit in 1812 at the time of Hull's surrender, and had been appointed to the command of a company of troops as captain, although generally called "Major Mack." When subsequently--and shortly after his appointment as captain--he was ordered by his superior officers to surrender, he was so highly indignant that he broke his sword across his knee and threw it into the lake, saying he would never submit to the disgraceful compromise. By the year 1820, according to the written statement of Horace Stanley, Stephen Mack was the proprietor of a large mercantile establishment in Detroit--large for those days, employing six clerks. Besides this establishment he had a number of stores in various parts of Michigan and Ohio. At his own expense he built a turn-pike road from Detroit to Pontiac where he owned a large farm upon which he lived. In 1828 he was a member of the council of the territory of Michigan. All this would indicate that Stephen Mack was a man of intelligence, judgment, enterprise, and successful withal. When he died he left his family an estate of $50,000, without incumbrance, which, in those days, was a large fortune. Temperance was the sister in law to Lucy Mack Smith, mother of the Prophet Joseph Smith.